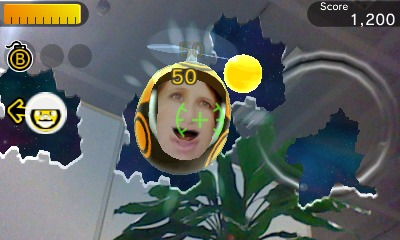 Take a photo of a face and it will transform into a flying head in a propeller helmet. You have to shoot down all of the faces as they appear in order to face the boss. If you fail, they come up close for a big kiss. The game uses the camera to show your environment. The faces bust through walls and fly all around you. Use the gyroscopic motion controls to aim and hit as many as you can. If you take too much damage, you can restore it by shooting the red butterflies that appear.